Released in the April issue of Perspectives, the list covers the top Joint Commission requirements that surveyors found to be noncompliant most often during 2018. Several hospital leaders with firsthand experience in crisis management shared insights on how to address communication issues—a core element of emergency preparedness—in a discussion I moderated at the annual Voalte User Experience conference. The hospital was notified in January of the deadline to pass an inspection. Failure to do so could result in Harper losing the funding that provides 85% of its inpatient revenue. Advocates who work for hospitals and health systems help patients navigate the care they receive within that system, as well as any associated financial responsibilities. They do so for all patients, free of charge, as part of their in-hospital services. Postmortem: Was the Failed Massachusetts Law Requiring Patient Limits for Nurses a Good Idea? The proposed law, which became known as “Question 1” because of its position on the referendum ballot, was soundly defeated in the November 2018 election, with about 70% of Massachusetts poll-goers voting “no.” An industry-backed campaign from hospital executives spent around $27 million exhorting voters to turn down the measure. Are Your Physicians Suffering from Burnout—or Moral Injury? 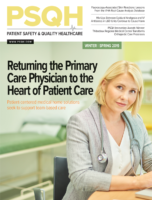 Research indicates that nearly half of physicians nationwide are experiencing burnout symptoms, and a study published in October found burnout increases the odds of physician involvement in patient safety incidents, unprofessionalism, and lower patient satisfaction. The report, Accelerating Transformation: Translating Strategy Into Action, outlines a road map for creating an organizational structure to improve safety, quality, patient experience, and workforce engagement. The report called for significant changes in nurses’ roles, responsibilities, and education to meet the increased demand for care and to make improvements to the healthcare system. The economic impact of sepsis on a national scale is significant, the CHEST researchers found in their study, which featured more than 1 million index admissions. The research published in Journal of the American Medical Association found exhaustion and cynicism were the primary drivers of increased burnout at Mass General’s physician organization.